The history of Hikuai from the time of European settlement is founded on kauri timber, gum and gold. About 8 million years prior to this the landscape was subjected to violent volcanic activity, responsible today to the unusual mountain formations. The Tairua-Hikuai area was chosen for settlement by the early Maoris. Evidence can be found of moa-hunting, while pa sites can be easily identified on reserves and farmland. The climate was pleasant all year round and fish and birds provided an abundance of food. In the early 1820’s several hundred Maori inhabitants were slaughtered by Hongi Hika and his warriors. From that time the Hikuai-Tairua area was never resettled by the Maoris. Hikuai was known as Pukiore and this name was used until 1900. The opening of the Thames goldfields in 1867 and the building of a town caused a great demand for timber. In 1868 a sawmill was set up at Tairua and run by Mr W B Jackson. He leased 3 acres of flat land at the upper tidal limit of the Tairua River and this became known as Jackson’s Landing. This became the principal base for distribution of provisions to men in the bush, as well as the main depot in the whole area for the collection and purchase of kauri gum. In 1878 Jackson’s Landing had a population of 42 and numbers remained constant for 13 years. Boats and paddle steamers regularly travelled from Tairua to Jackson’s Landing to discharge cargo and passengers. In 1885 a 24 bed hotel (Laycock’s Hotel) was built at Upper Landing which was about 200 metres from Prescott’s Garage on Settlement Road. In 1893 gold was discovered at Puketi between the second and third branches of the Tairua River. The claim was called Golden Hills. This discovery brought many hopeful diggers and Jackson’s Landing was just the right place to supply their needs. In 1895 a claim of 100 acres was pegged out and known as Broken Hills. 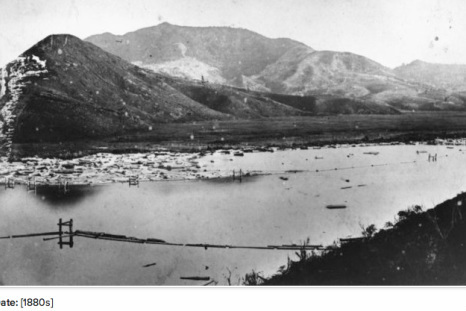 By 1877 most of the tributaries of the Tairua River (all in the Hikuai area) were equipped with kauri dams. As these dams were filling, logs were dragged into the dry river beds below. At the height of a flood, often in the middle of the night all the dams would be tripped in synchronised order, so as to create the most effective flow of water when the logs reached the main river. Anywhere from a few hundred to several thousand logs would be driven down to the booms by this means in a single drive. 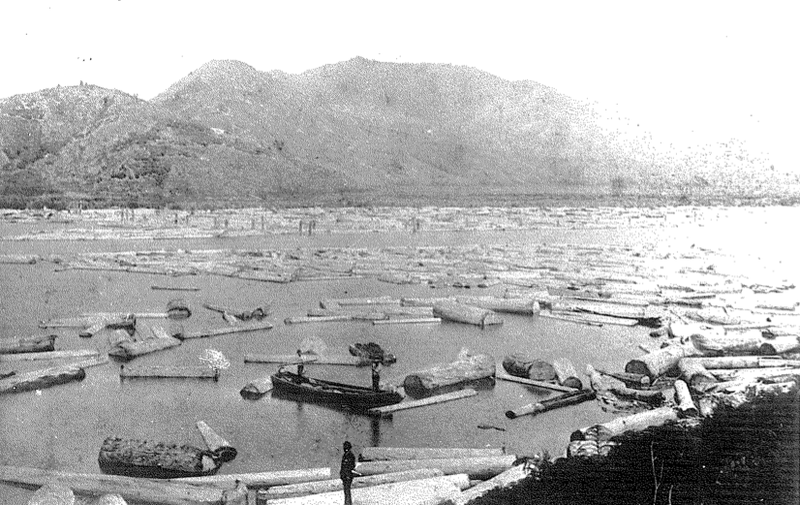 As the main river was scoured out and deepened by successive log drives it became possible for even small ocean going cutters to travel upstream from Tairua. Heavy freight and machinery could finally be brought up to the old bridge over the Tairua River. This bridge was built in 1928. Until January 1895 land in Hikuai was owned by the Crown but after the Tairua Land Act local settlers were able to purchase sections and in 1897 the Hikuai Post Office was opened. The first telephone a few years later was a private line belonging to the mine. In 1908 Hikuai Post Office was given a telephone. The Tairua River provided the chief means of transport for many years. The local roads in 1903 were described as mud streams. It took five hours for a laden four horse wagon to travel between Hikuai to the Broken Hills mine –about ten miles. In 1928 a road from Hikuai to Waihi was finally opened for motor traffic but it was not until 1933 that reasonably safe access between Hikuai and Tairua was provided. In 1970 this road was reformed, raised and sealed. The opening of the Kopu – Hikuai Highway in 1967 opened the Coromandel Peninsula to easy road access for farm produce and tourists. A major step forward in the development of the Hikuai district was the introduction of electricity in 1962.